Looking for the perfect dress to add to your handmade wardrobe? How about one that is two dresses in one? Sew Liberated’s Metamorphic Dress is probably one of the most versatile sewing patterns we have found. Not only is this dress fully reversible, it also features two unique looks in one go-to garment. On one side, enjoy the layered look with the unique curved hem top layer with a peak at the layer underneath and optional patch pockets. Turn it inside out to find a simple sleeveless dress with clean lines and in-seam pockets. The versatility doesn’t stop there! The Metaphoric is a great staple on its own for the warm weather months but also transitions beautifully to year-round wear. Layer it over a long sleeve knit shirt/dress, turtleneck, leggings or jeans for even more amazing looks. Now the big question is which fabrics to pick?! Before we dive into a new project, one of our favorite things to do it is check out some of the amazing versions other seamstresses have sewn. 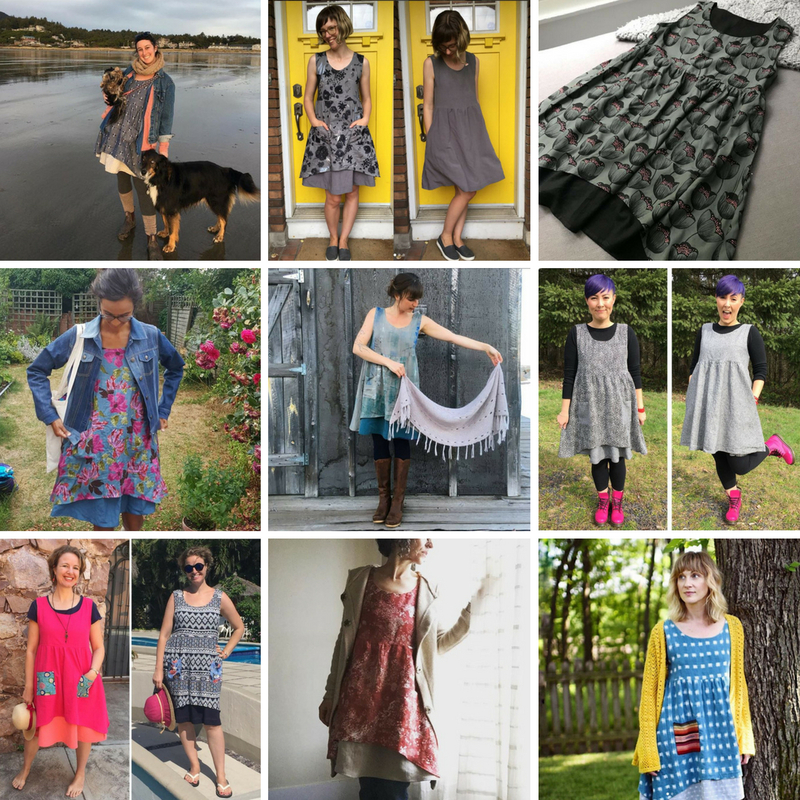 Instagram is a great resource for this both on the designer’s page and under the pattern’s hashtag—in this case @sewliberated and #metamorphicdress. Watch for what types of fabrics, prints, colors, etc, others have chosen. Also, see what jumps out to you or what you would want to change. Here are a few of our favorites from #metamorphicdress feed! 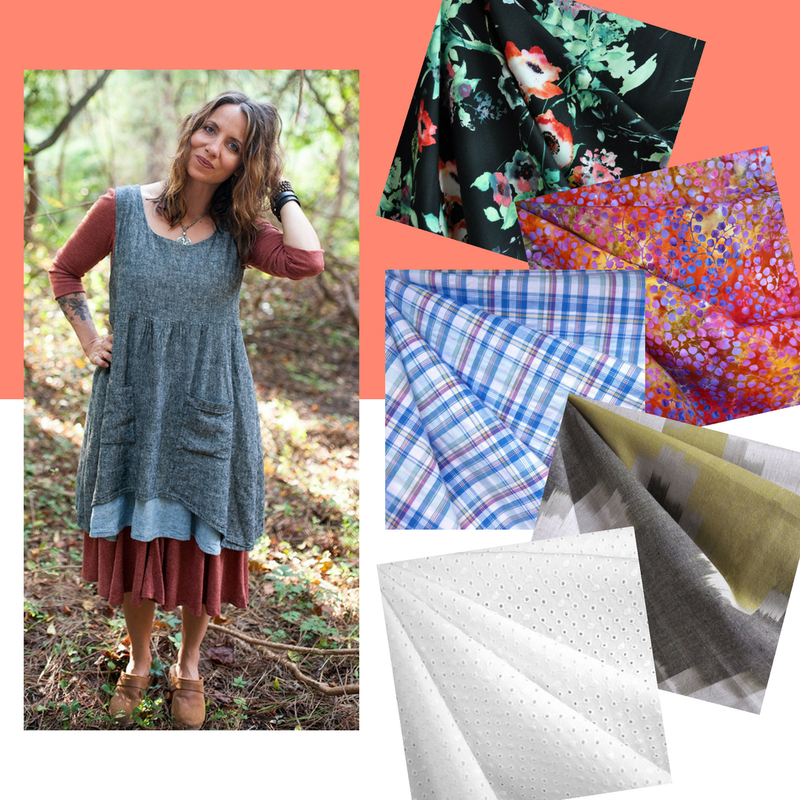 After looking at lots of inspiration and playing around with some of our own fabric choices for the Metamorphic Dress we came up with a few recommendations for when selecting your own. Look for two fabrics that are a similar weight and drape—This will help the fabrics behave well together no matter which layer is right side out. Think about the wrong side—You will see the wrong side of the longer layer when worn with the layered look out. We recommend choosing a solid, yarn-dyed, over-dyed or reversible fabric where both sides will be the same or very similar. Check your layers—If your fabrics aren’t totally opaque,make sure to check how they look layered on top of each other, wrong sides together. Now let’s take a look at five of our favorite fabric combinations for the Metamorphic Dress! Don’t be afraid to choose two fabrics that are the same color. The result is a classic tonal dress that looks amazing from either side. You also don’t need to shy away from fabrics that are lighter weight or color, the dress ends up being completely lined by the under layer. Win, win! Linen and eyelet are always summer favorites and this is a unique way to incorporate them into the same garment. 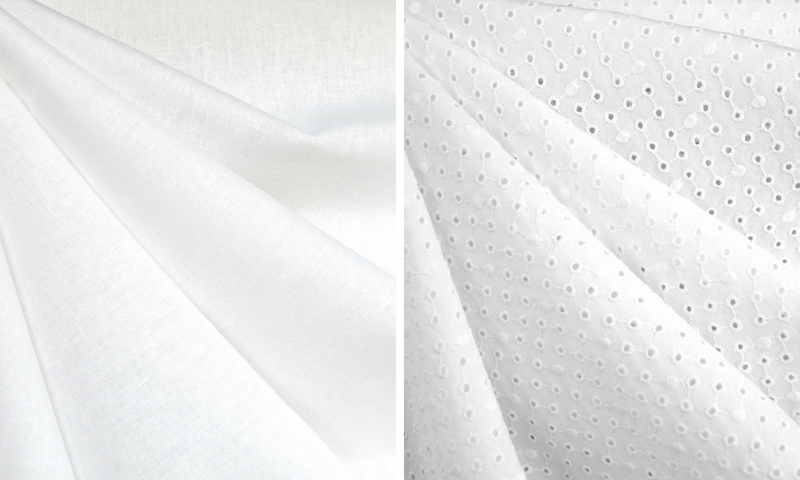 We’d use the linen blend for the shorter layer and have the eyelet peak out at the bottom. Then when it is reversed you get a fully lined white eyelet dress! 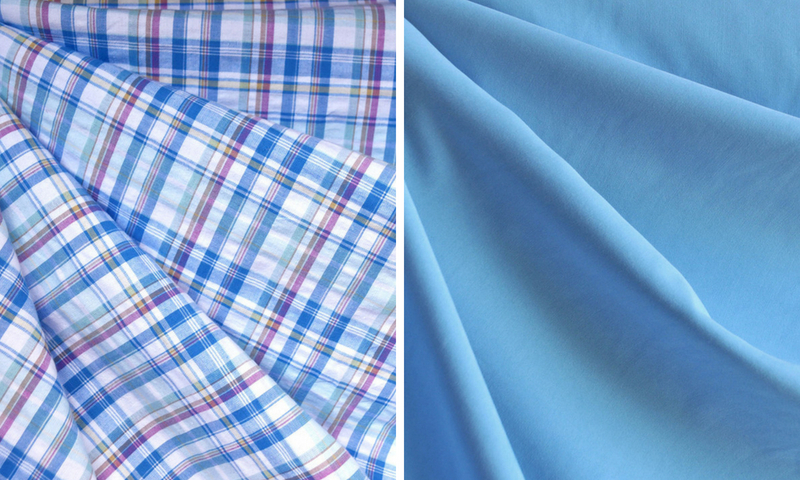 Linen, linen blends and shirtings are a great place to start in your fabric search. Similar in weight, body and texture, they are great paired together! Print, or no print? When considering a print fabric for this dress, we recommend using it for the shorter layer and pairing it with a solid or “neutral” for the longer layer. That way you can turn the print to the inside and have a simple, classic look on the other side. That being said, the more “neutral” side doesn’t have to be boring! 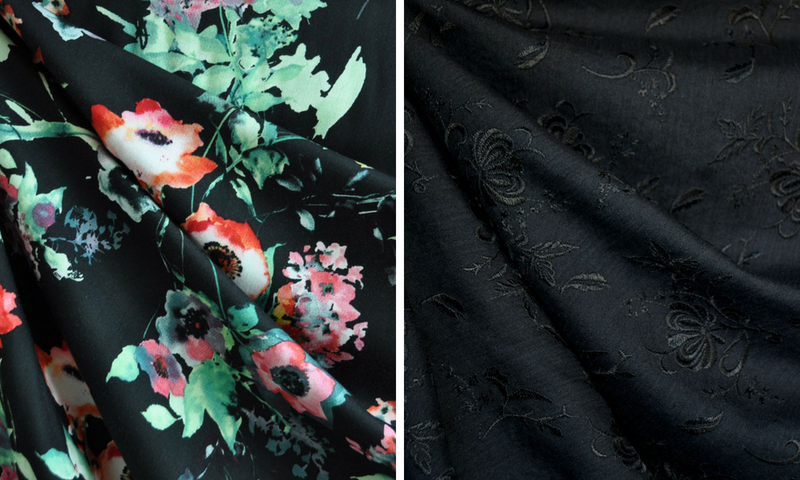 Experimenting with print/solid combinations we are loving this gorgeous black ground watercolor floral rayon paired with a solid black embroidered rayon crepe. From one side you will have a stunning floral dress with just a bit of black underlining and from the other side a classic Little Black Dress with a totally unique texture and look! Rayons are another great option for the Metamorphic. Soft and drapey, the layers will play wonderfully together without being to heavy or hot. Be sure to think about the reverse sides of the fabrics as printed rayons typically don’t have anything on the wrong side. When in doubt ask, swatch or go with a solid—our personal favorite is this rayon batiste! Yarn-dyed wovens are always a great choice since they look the same on both sides. Plaids, checks, chambrays, ikats…you get the idea. 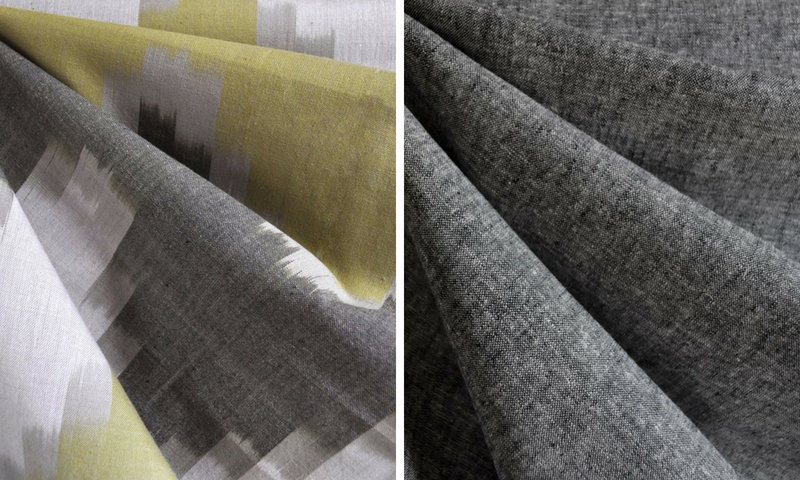 Here we took a similar approach to our print/solid combination and chose a large chevron ikat and paired it with a chambray-look linen blend in a coordinating black/grey. These two look amazing together and they give you that great flexibility of a unique bohemian design on one side and a more classic linen look on the other. Both great looks for summer! Here is another yarn-dyed combination where we paired a simple plaid cotton shirting with a modal blend solid for a bit of summer fun and color for both sides of the dress. The plaid is reversible but we would again make the solid the longer layer for the extra flexibility. You can never have too many simple solid dresses that you can dress up or down depending on the situation. Add a statement necklace, scarf or cardigan for a variety of different looks. This modal blend shirting and the washer linen blend (shown previously) are both great staples to pair with prints, plaids, etc. They have just enough drape and body to pair with cottons and rayons alike and they come in a bunch of great colors! 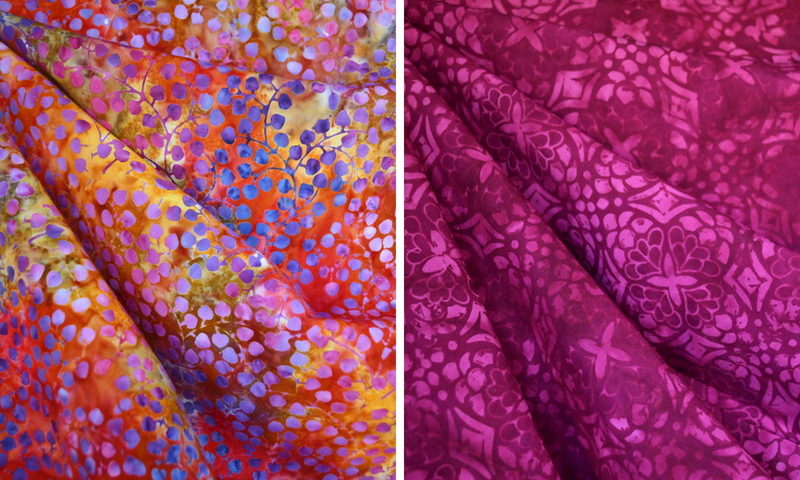 Wonderfully soft and drapey rayon batiks are a dream fabric for a summer Metamorphic Dress! Reversible by nature from the over dyed technique used to create these hand dyed beauties, it doesn’t matter which is the shorter layer and which is the longer. And you can’t go wrong with these striking colors and often intricate designs. The biggest problem is which to pick for which layer? We are kind of partial to the multi colored vine batik for the shorter layer and the pop of fuchsia poking out at the bottom. How about you? You can probably see why Sew Liberated’s Metamorphic Dress is one of our best sellers this summer! It looks amazing in any number of fabrics and can suit a variety of roles in your handmade wardrobe. It is also the perfect dress for capsule wardrobe planning and traveling. With two dresses and two looks in one, what could be bad? We always have so many fabric/pattern pairing ideas and this was a new way for us to share them with all of you. If you liked this format of fabric recommendations, let us know in the comments below or via email! We’d also love to hear which indie pattern you’d like to see for the next installment of One Pattern, Five Fabrics! I really love this — especially in the rayon batiks! As a fairly new sewist, however, I’m wondering if this is a bit beyond my skill level at this point? Thanks! (and I think I’ll purchase the pattern anyway — and get to it as I’m able). I think you can do it! And I believe there is a sewalong…google it! Good luck! The fabric suggestions are sewwwww helpful! Please do this for other patterns, I so often get stumped.